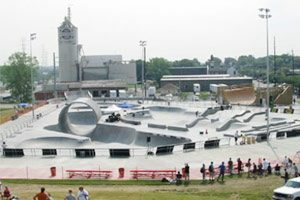 The Extreme Park is in Louisville, Kentucky. The park is 40,000 sq. 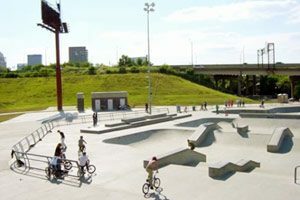 ft., and the Louisville Metro Government (the owners of the park) are planning on adding an additional 20,000 sq. ft. of indoor skate-able terrain. 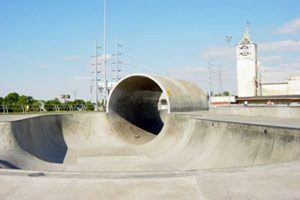 This enormous concrete playground ranks as one of the largest skate parks in the USA. If the size of this park doesn’t catch your attention then maybe their 24 ft. full-pipe will. They also have rails, stairs, and fun boxes galore and they also have 8 different pools. The pools consist of two 11 ft. pools, two 8 ft. pools, two 6 ft. pools, and two 4 ft. pools. Among the unique features of the park are its hours of operation. The park is actually open 24 hours a day, 365 days a year, providing skating, biking or inline bliss on demand!